Generations of children have grown up with The Wind In The Willows, the charming adventures of Ratty, Mole, Badger and Mister Toad in the English countryside. Kenneth Grahame's story has been adapted numerous times, including a Disney featurette in 1949. For many Brits of a certain vintage though, the most beloved adaptation of all was Cosgrove Hall's stop-motion take, starting as a 1983 TV movie, and being followed up with a TV series running between 1984 and 1988. 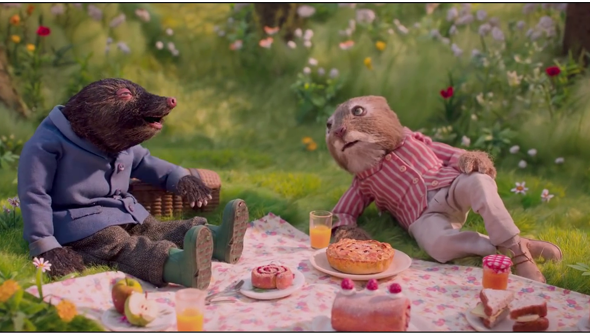 It's this version of the story which seems to have inspired this new campaign video from British charity Wildlife Trusts. The film is designed to draw attention to the plight of UK wildlife, numbers of which have been greatly reduced since Grahame's book was first published. It contrasts the bucolic, nostalgic, charms of the characters with the realities of climate destruction to heartbreaking effect, but ends on a hopeful note. It is presented as a fake trailer, and will be screened in UK cinemas, as well as being released online. The animation and design on the characters is perfect, and it'll likely leave you a little disappointed that this isn't a real trailer. The casting is fantastic too, featuring the voices of Stephen Fry, Catherine Tate, Asim Chaudhry, Alison Steadman and a voice over from the legendary Sir David Attenborough. The film has been produced by BAFTA-winning London Agency Don't Panic. Visit The Wildlife Trust to see how you can help.